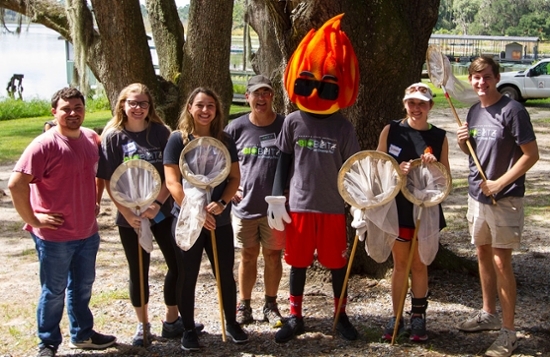 VALDOSTA — Valdosta State University and Moody Air Force Base invite community members of all ages to BioBlitz on Saturday, April 13, at Grassy Pond. BioBlitz is an opportunity for children and adults to work side by side with scientists and naturalists to find and identify as many species as possible in a specific area over a short period of time. Dr. Emily Cantonwine, BioBlitz organizer and a professor in VSU’s Department of Biology, said expertise is not necessary. Participants only need a desire to get outside, to connect with the environment, to learn, to meet new people, and to discover — all while generating useful data for science. BioBlitz activities will run from 7 a.m. to 4 p.m. on Saturday, April 13 p.m. and include opportunities for budding citizen scientists to work with regional experts to observe and/or collect birds, fishes, reptiles, amphibians, plants, fungi, insects and mammals. Family friendly activities will run from 10 a.m. to 2 p.m. with scavenger hunts, letterboxes, and geocaches, as well as a number of science and art educational booths that are sure to inspire curiosity and creativity in the great outdoors. In addition to learning more about the biodiversity of Grassy Pond, adult participants will have opportunities to improve their nature photography skills and learn how to use the iNaturalist app to identify species. Interested participants are encouraged to visit the “biodiversity” and “observations” links at www.valdosta.edu/bioblitz to see how each organism group will be surveyed and to find ways to contribute to and prepare for the big BioBlitz event. Grassy Pond is located at 5360 Grassy Pond Road in Lake Park, Georgia. Entry is free for all BioBlitz participants. BioBlitz activities are free and open to the public. Please visit www.valdosta.edu/bioblitz to learn more.